Systemic vasculitis associated with autoantibodies to neutrophil cytoplasmic antigens (ANCA) is the most frequent cause of rapidly progressive glomerulonephritis. Renal failure at presentation carries an increased risk for ESRD and death despite immunosuppressive therapy. This study investigated whether the addition of plasma exchange was more effective than intravenous methylprednisolone in the achievement of renal recovery in those who presented with a serum creatinine >500 μmol/L (5.8 mg/dl). A total of 137 patients with a new diagnosis of ANCA-associated systemic vasculitis confirmed by renal biopsy and serum creatinine >500 μmol/L (5.8 mg/dl) were randomly assigned to receive seven plasma exchanges (n = 70) or 3000 mg of intravenous methylprednisolone (n = 67). Both groups received oral cyclophosphamide and oral prednisolone. The primary end point was dialysis independence at 3 mo. Secondary end points included renal and patient survival at 1 yr and severe adverse event rates. At 3 mo, 33 (49%) of 67 after intravenous methylprednisolone compared with 48 (69%) or 70 after plasma exchange were alive and independent of dialysis (95% confidence interval for the difference 18 to 35%; P = 0.02). As compared with intravenous methylprednisolone, plasma exchange was associated with a reduction in risk for progression to ESRD of 24% (95% confidence interval 6.1 to 41%), from 43 to 19%, at 12 mo. Patient survival and severe adverse event rates at 1 yr were 51 (76%) of 67 and 32 of 67 (48%) in the intravenous methylprednisolone group and 51 (73%) of 70 and 35 of (50%) 70 in the plasma exchange group, respectively. Plasma exchange increased the rate of renal recovery in ANCA-associated systemic vasculitis that presented with renal failure when compared with intravenous methylprednisolone. Patient survival and severe adverse event rates were similar in both groups. Combination therapy with cyclophosphamide and prednisolone leads to remission in 80 to 90% of patients.12 However, those who present with advanced renal failure have poorer outcomes, with only 50% surviving with independent renal function at 1 yr.5 The addition of intravenous methylprednisolone or plasma exchange has been advocated for those with severe vasculitic presentations.13 Plasma exchange was introduced for the removal of anti–glomerular basement membrane (GBM) antibodies in Goodpasture disease and used subsequently in crescentic glomerulonephritis without anti-GBM antibodies.14–16 A randomized trial in the latter group found improved outcomes with plasma exchange in those with severe renal failure at presentation.15 After the discovery of ANCA in the sera of patients with vasculitis and evidence supporting the pathogenicity of ANCA, a rationale has emerged for early plasma exchange to reduce levels of circulating ANCA and contribute to disease control in vasculitis. The European Vasculitis Study Group has defined a “severe renal” subgroup as being patients who present with a serum creatinine >500 μmol/L (5.8 mg/dl) attributable to active vasculitis.17 This study compared the addition of either intravenous methylprednisolone or plasma exchange with cyclophosphamide and oral prednisolone in severe renal vasculitis, with renal recovery as the primary outcome measure. A total of 151 patients were screened between March 1995 and October 2002; nine were excluded for noneligibility (circulating anti-GBM antibodies, n = 8; and >500 mg intravenous methylprednisolone, n = 1), four declined further participation, and one center withdrew (n = 1; Figure 1). A total of 137 patients were randomly assigned to receive intravenous methylprednisolone (n = 67) or plasma exchange (n = 70). There were no significant differences in demographic, clinical, or laboratory features at the time of randomization (Table 1). All cases had histologic confirmation of the diagnosis. Subsequent histologic review of 102 (75%) of 137 diagnostic biopsies found no differences in the frequency or severity of histologic lesions between the two treatment groups (Table 2). Enrollment, patient survival, and renal outcome during the trial. By 3 mo, renal recovery had occurred in 33 (49%) of 67 of the intravenous methylprednisolone group and 48 (69%) of 70 of the plasma exchange group (95% confidence interval [CI] for the difference 18 to 35%; P = 0.02). Renal recovery had occurred by 6 wk in 66 and by 3 mo in 81 patients. At 12 mo, two from each group who had recovered renal function progressed to ESRD. Twenty-nine (43%) of 67 overall and 29 (57%) of 51 survivors in the intravenous methylprednisolone group and 41 (59%) of 70 overall and 41 (80%) of 51 survivors in the plasma exchange group remained alive and independent of dialysis (95% CI 4 to 40%; P = 0.008; Figure 2A). The hazard ratio for ESRD over 12 mo for plasma exchange versus intravenous methylprednisolone groups was 0.47 (95% CI 0.24 to 0.91; P = 0.03). The risk reduction for ESRD at 3 mo (23 [41%] of 56 for methylprednisolone versus 11 [19%] of 59 for plasma exchange) was 22% (95% CI 6.2 to 39). The risk reduction for ESRD at 12 mo (22 [43%] of 51 for methylprednisolone versus 10 [19%] of 51 for plasma exchange) was 24% (95% CI 6.1 to 41). The association of renal recovery and treatment with plasma exchange remained in the multivariate analysis (P = 0.04), but renal recovery was not significantly associated with stratification, age, diagnosis, or ANCA subtype. (A) Proportion of patients in each group without progression to ESRD. ESRD required at least 6 wk of dialysis dependence (intravenous methylprednisolone group [MP] versus plasma exchange group [PE] P = 0.008). 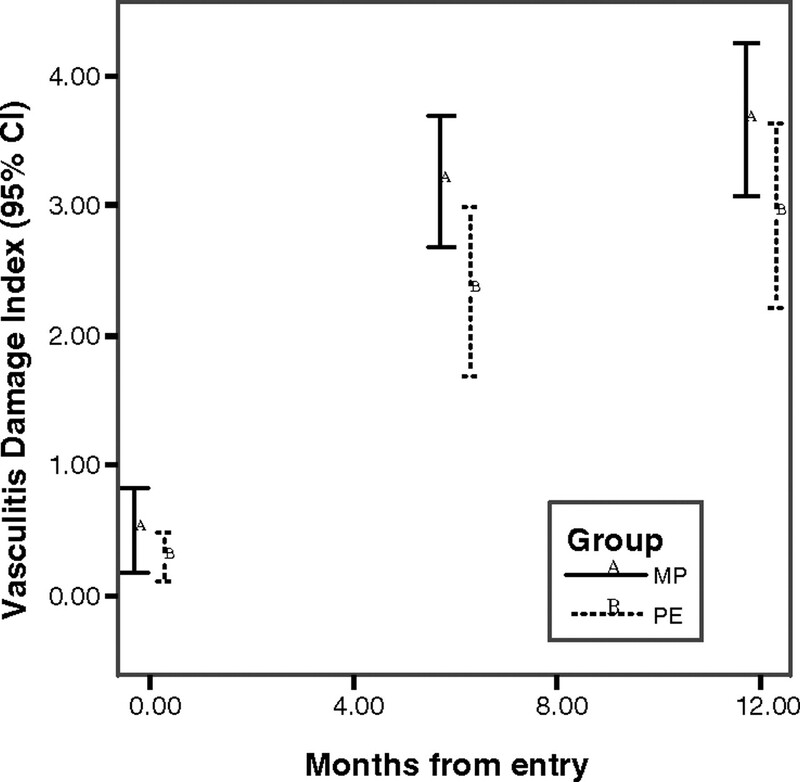 (B) Proportion of patients in each group who survived during the trial (MP versus plasma exchange group P = 0.68). (C) For patients who were alive at 6 wk (119 of 137), the proportion of patients who subsequently survived according to whether they had recovered renal function or had reached end-stage renal failure at 6 wk (P = 0.005). Patient survival at 3 and 12 mo was 56 (84%) of 67 and 51 (76%) of 67 in the intravenous methylprednisolone and 59 (84%) of 70 and 51 (73%) of 70 in the plasma exchange groups (log rank test P = 0.68; Figure 2B). The major causes of death were infection (n = 19), pulmonary hemorrhage (n = 6), and cardiovascular disease (n = 4). Patient survival was not significantly different between treatment groups and was not influenced by stratification, age, diagnosis, or ANCA subtype. In those who survived beyond 6 wk, renal recovery was associated with increased patient survival between 6 wk and 12 mo (P = 0.005; Figure 2C). A total of 244 adverse events were reported in 122 patients (Table 3). Severe or life-threatening events occurred in 32 (48%) of 67 of the intravenous methylprednisolone group and 35 (50%) of 70 of the plasma exchange group (P = 0.80). Leukopenia and infection were the most common adverse events. Although uncommon, severe thrombocytopenia and thrombosis were seen only in the plasma exchange group and may have been related to the procedure (Table 3). There was no significant difference in the serum creatinine at 12 mo for those who recovered renal function between the two groups: 198 μmol/L (2.24 mg/dl; 95% CI 172 to 225) for the intravenous methylprednisolone group and 199 μmol/L (2.25 mg/dl; 95% CI 177 to 224) for the plasma exchange group (P = 0.87; Figure 3). Sequential serum creatinine (μmol/L) for those who recovered renal function (mean; 95% confidence interval [CI]). Scores for new or worse disease fell promptly with remission induction therapy and were similar between groups (Figure 4). Scores for persisting disease fell more slowly and remained at low levels during the trial without significant differences between groups. Sequential Birmingham Vasculitis Activity Score for new/worse disease (mean; 95% CI). By 6 and 12 mo, more damage accrued in the intravenous methylprednisolone group (mean 3.2 [95% CI 2.7 to 3.7] and 3.7 [95% CI 3.1 to 4.2]) than in the plasma exchange group (mean 2.3 [95% CI 1.7 to 3.0; P = 0.005] and 2.9 [95% CI 2.2 to 3.6; P = 0.02], respectively). In both groups, there were significant increases in damage between 0 and 6 mo (P < 0.001; Figure 5). Sequential Vasculitis Damage Index scores (mean; 95% CI). Physical and mental health measures all were >30% below the UK population norm at entry, with perceived role limitation due to physical problems at >70% below the norm. Physical health measures remained below control figures during the remission phase. Mental health measures improved to an average of 14% less than the control population at remission. Within-sample averages, for the whole cohort, showed a significant improvement with time throughout the trial (P < 0.001). No significant differences in Short-Form 36 (SF-36) scores were observed between groups. This study found a higher rate of renal recovery and dialysis independence after plasma exchange than after the addition of intravenous methylprednisolone for patients with Wegener's granulomatosis or microscopic polyangiitis and a creatinine at diagnosis >500 μmol/L (5.8 mg/dl). This effect was sustained to 12 mo from entry with only two from each group progressing to ESRD after initial recovery. The serum creatinine at 12 mo in those with renal recovery (mean 199 μmol/L [2.25 mg/dl]) is compatible with sustained renal independence in the absence of relapse of renal vasculitis.5, 18 The degree of glomerulosclerosis and tubulointerstitial fibrosis is predictive of a poor renal outcome.19 Central review of diagnostic biopsies in this study found no differences in histologic variables between treatment groups, but because only 75% of biopsies were analyzed, an imbalance in the severity of fibrotic lesions cannot be entirely excluded. The risk reduction of 24% for ESRD with plasma exchange is of clinical importance in view of the cost, morbidity, and mortality of end-stage renal failure, and the additional costs of plasma exchange are outweighed by these savings. The improvement in renal recovery rates with plasma exchange in the severe renal subgroup is consistent with our hypothesis that plasma exchange is most likely to be of benefit in those with the most severe disease. This study excluded patients who had been dialysis dependent for >2 wk because they were considered to have little chance of renal recovery. Mortality was 25.5% at 12 mo, considerably higher than in vasculitis studies without severe renal failure, with infection and lung hemorrhage being the major causes of death.12, 29 Most deaths occurred during the first 3 mo, when corticosteroid dosages were highest and vasculitis was most active. A link among cyclophosphamide, neutropenia, sepsis, and death was previously shown, as was the independent role of steroid dosage on infective risk.5 However, after 3 mo, there was a higher mortality in those who had failed to recover renal function, confirming results from cohort studies.5 Thus, effective early therapy is imperative to avoid vasculitic death and maximize the chance of renal recovery. When compared with a study from this group of vasculitis with serum creatinine <500 μmol/L (5.8 mg/dl), patients in this study were older (mean 64.3 versus 55.6 yr; P < 0.0001). They were also more likely to have a diagnosis of microscopic polyangiitis (69 versus 39%; P < 0.0001) and to be MPO-ANCA positive (52 versus 37%; P = 0.003).12 Age has previously been shown to be associated with early mortality in renal vasculitis and may have accounted, in part, for the high mortality that was seen in this study.5, 18 The contribution of drug toxicity to the mortality of severe renal vasculitis indicates that dosing of cyclophosphamide and corticosteroids in this patient group requires urgent consideration and emphasizes the need for safer agents. Patients were recruited from 28 hospitals in nine European countries with local ethical approval after giving written informed consent. The study conformed to the 1964 Declaration of Helsinki and subsequent amendments. All patients received the same oral drug regimen of cyclophosphamide and prednisolone. At trial entry, patients were randomly assigned to receive, in addition, either intravenous methylprednisolone or plasma exchange. At 6 mo, cyclophosphamide was withdrawn and azathioprine was commenced. The study duration was 12 mo. Inclusion required (1) a diagnosis of Wegener's granulomatosis or microscopic polyangiitis, using criteria adapted from the disease definitions of the Chapel Hill consensus conference1, 12; (2) biopsy-proven, pauci-immune, necrotizing, and/or crescentic glomerulonephritis, in the absence of other glomerulopathy; and (3) serum creatinine >500 μmol/L (5.8 mg/dl). Exclusion criteria were (1) age <18 or >80 yr; (2) inadequate contraception in women of child-bearing age; (3) pregnancy; (4) previous malignancy; (5) hepatitis B antigenemia, anti–hepatitis C virus, or anti-HIV antibody; (6) other multisystem autoimmune disease; (7) circulating anti-GBM antibodies or linear IgG staining of the GBM on renal biopsy; (8) life-threatening nonrenal manifestations of vasculitis, including alveolar hemorrhage requiring mechanical ventilation within 24 h of admission; (9) dialysis for >2 wk before entry; (10) creatinine >200 μmol/L (2.3 mg/dl) ≥1 yr before entry; (11) a second clearly defined cause of renal failure; (12) previous episode of biopsy-proven necrotizing and/or crescentic glomerulonephritis; (13) >2 wk of treatment with cyclophosphamide or azathioprine; (14) >500 mg of intravenous methylprednisolone; (15) plasma exchange within the preceding year; (16) >3 mo of treatment with oral prednisolone; and (17) allergy to study medications. Both groups received oral cyclophosphamide 2.5 mg/kg per d (2 mg/kg per d for age >60 yr), reduced to 1.5 mg/kg per d at 3 mo and stopped at 6 mo. Azathioprine 2 mg/kg per d was commenced at 6 mo. Oral prednisolone was tapered from 1 mg/kg per d at entry to 0.25 mg/kg per d by 10 wk, 15 mg/d at 3 mom and 10 mg/d from 5 to 12 mo. Prophylaxis against steroid-induced gastritis, fungal infection, and Pneumocystis jirovecii pneumonia was suggested but was not mandatory. The intravenous methylprednisolone group received 1000 mg/d intravenous methylprednisolone for three consecutive months, starting on the day of entry. Because plasma exchange protocols varied between participating centers, investigators were permitted to use their local procedure with respect to (1) plasma filtration or centrifugation, (2) vascular access, (3) anticoagulation, and (4) daily or alternate-day exchanges. The following aspects of the procedure were mandated in the protocol: (1) A total of seven plasma exchanges within 14 d of study entry, (2) a plasma exchange volume of 60 ml/kg on each occasion, and (3) volume replacement with 5% albumin. The use of fresh frozen plasma at the end of the procedure to replenish coagulation factors was recommended but not mandated for patients who were at risk for hemorrhage, for example after kidney biopsy. Study assessments were performed after 0, 1.5, 3, 6, 9, and 12 mo. They included full blood count, erythrocyte sedimentation rate, C-reactive protein, alanine transaminase, serum creatinine, and glucose. Disease activity was measured by the Birmingham Vasculitis Activity Score.38 Cumulative all-cause damage was scored in the Vasculitis Damage Index at 0, 6, and 12 mo.39 The SF-36 questionnaire was performed at each assessment.40 Adverse events were graded by 22 predefined criteria into mild, moderate, severe, or life threatening. A total of 102 (75%) renal biopsies from the 137 patients in the study were available for central review; in two, there was insufficient material for further analysis. Biopsies were taken at diagnosis and scored according to a previously standardized protocol.3, 19 Briefly, each glomerulus was scored separately for the presence of fibrinoid necrosis, crescents (cellular/fibrous and segmental/circumferential), sclerosis (local, segmental, or global), periglomerular infiltrates, granulomatous reactions, and other lesions. Affected glomeruli were reported as the percentage of the total number of glomeruli in a biopsy. Most interstitial, tubular, and vascular lesions were scored dichotomously, except for interstitial infiltrates, type of cellular infiltrates (neutrophils, mononuclear cells, and eosinophils), interstitial fibrosis, and tubular atrophy, which were scored semiquantitatively. Each biopsy was evaluated by two observers. Discrepancies between observers were resolved by conference during central reviews to achieve a consensus for each biopsy. The average distribution of glomerular, tubulointerstitial, and vascular lesions was evaluated for the total group of patients for whom histologic data were available. Comparisons between treatment groups were performed by independent-samples t test for glomerular lesions and by nonparametric analysis (Wilcoxon-signed rank test) for tubulointerstitial and vascular lesions. The primary efficacy measure was renal recovery at 3 mo defined by patient survival, dialysis independence, and serum creatinine <500 μmol/L (5.8 mg/dl). Secondary end points included patient survival at 12 mo; ESRD, defined by dialysis requirement for at least 6 wk without subsequent renal recovery; serum creatinine in recovering patients at 12 mo; and adverse event rates. Randomization was performed centrally by permuted blocks of four stratified by country and by whether the patient was nonoliguric or likely to require dialysis within the next 48 h. Primary data were collected in record books and submitted for centralized computer entry. The data were validated against the record books before analysis (SPSS PC statistical package, version 9; SPSS, Chicago, IL) by two data managers who had sole access to the data. The predicted renal recovery rate for the intravenous methylprednisolone group was 50%, and the study was designed to detect an increase in recovery rate in the plasma exchange group of >20% (i.e., from 50% to at least 70%).41 Allowing for a 10% dropout, 150 patients were required to achieve a significance level of 0.05 (two sided) and power of 0.8. The primary end point was analyzed according to the intention-to-treat principle with death being regarded as a failure to achieve renal recovery. Renal recovery rates at 3 mo were compared by the Pearson χ2 test. Renal and patient survivals between groups were compared by the log-rank test. A Cox regression model was used to determine the hazard ratio for renal survival. The influence of treatment group, stratification (nonoliguric or dialysis requiring), age, diagnosis (Wegener's granulomatosis or microscopic polyangiitis), and ANCA subtype (PR3-ANCA or MPO-ANCA) on renal recovery and patient survival were assessed by Cox proportional hazards analysis. Patient survival after 6 wk was compared between patients who had recovered renal function and those who had not by log-rank test. Demographic details, adverse events, Birmingham Vasculitis Activity Score (area under the curve), serum creatinine, and Vasculitis Damage Index were compared between groups by Mann-Whitney U test or Pearson χ2 test. SF-36 mean scores were calculated for each of the eight dimensions using the Likert method of summated ratings, and change in scores over time was compared between groups by repeated measures analysis. All tests of significance were two sided and were considered significant at the 0.05 level. No interim analyses were performed. This trial was designed and launched as part of the European Community Systemic Vasculitis Trial project (contract nos. BMH1-CT93-1078 and CIPD-CT94-0307) and finished as part of the Associated Vasculitis European Randomized Trial project (contract nos. BMH4-CT97-2328 and IC20-CT97-0019) funded by the European Union. We thank Jo Hermans (Leiden, Netherlands) and Paul Landais (Paris, France) for statistical advice, Helen Talbot (Edinburgh, UK) for software design, UK for data management, and Lucy Jayne (London, UK) for trial administration. Participating physicians: M. Wissing, Institut Edith Cavell, Brussels, Belgium; J. Sennesael, AZ VUB Jette, Brussels, Belgium; M. Dhaene, Clinique Louis Caty, Baudour, Belgium; I. Rychlik, 3rd Faculty of Medicine, Prague, Czech Republic; A. Wiik, Statens Seriminstitutet, Copenhagen, Denmark; A. Ekstrand, Helsinki University Hospital, Helsinki, Finland; P. Lesavre, Hôpital Necker, Paris, France; P. Vanhille, Centre Hospitalier, Valenciennes, France; K. de Groot, University Hospital, Hannover, Germany; O. Hergesell, K. Andrassy, Heidelberg University Hospital, Heidelberg, Germany; H. Rupprecht, S. Weidner, Klinikum Nürnberg, Nürnberg, Germany; R. Nowack, W. Schmitt, University Hospital, Mannheim, Germany; M. Vischedyk, St. Vinzenz-Hospital Paderborn, Paderborn, Germany; F. Ferrario, Ospedale San Carlo Borromeo, Borromeo, Italy; R. Confalonieri, Ospedale Niguarda, Niguarda, Italy; J. Dadoniene, University of Vilnius, Vilnius, Lithuania; E.C. Hagen, University Eemland Hospital, Amersfoort, Netherlands; C. Verburgh, Leiden University Medical Center, Leiden, Netherlands; J.W. Cohen Tervaert, Maastricht University Medical Center, Maastricht, Netherlands; M. Valles, Hospital Josep Trueta, Girona, Spain; R. Poveda, Hospital Bellvitje, Barcelona, Spain; J. Ballerin, F. Calero, Fundación Puigvert, Barcelona, Spain; M. Heimburger, Huddinge University Hospital, Huddinge, Sweden; M. Segelmark, G. Sterner, University Hospital of Malmö, Malmö, Sweden; M. Tidman, Nephrology University Hospital, Orebro, Sweden; D. Adu, L. Harper, Queen Elizabeth II Hospital, Birmingham, UK; P. Mathieson, C. Tomson, Southmead Hospital, Bristol, UK; R. Luqmani, N. Turner, Royal Infirmary, Edinburgh, UK; J. Feehally, University Hospital, Leicester, UK; P. Mason, Churchill Hospital, Oxford, UK; A. Burns, Royal Free Hospital, London, UK; D. Oliveira, St. George's Hospital, London, UK; J. Stevens, Southampton Hospital, Southampton, UK; A. Williams, Morriston Hospital, Swansea, UK. See the related editorial, “Removing Antibody and Preserving Glomeruli in ANCA Small-Vessel Vasculitis,” on pages 1987–1989. Can We Identify Patients with Microscopic Polyangiitis Who Are at Risk of Relapse? ANCA Disease: Where Is This Field Heading?